Recently we were hired by one of our customers to undertake traffic management duties to enable them complete detailed engineer's surveys of bridges without closing the bridges to traffic. In some cases we were able to operate traffic lights and on other occassions we had to provide trained personnel to operate a Stop / Go system to ensure traffic flow was kept moving with minimum delays for the duration of the survey. Below is a picture of the truck mounted under bridge inspection unit just completing a survey of a bridge. 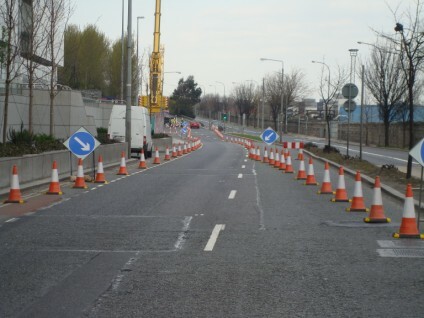 We recently provided complete Traffic Management Services on a project in Dublin, which required a lane closure on a Dual Carriageway. This included preparing the Traffic Management Plan, liaising with the City Council & Garda, basically we took care of everything on behalf of our customer thus enabling them focus on their core tasks. The project was completed on a Sunday morning to ensure that delays were kept to a minimum. Below is a picture of the project. Pictured below is Road Traffic Management Services Ltd. receiving their “FAS Signing, Lighting & Guarding of Roadworks” certificates from An Tánaiste, Mary Coughlan at a ceremony held in Ballybofey. 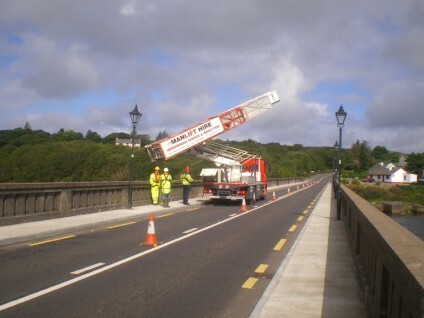 Mary Coughlan was delighted to see that a local company had taken the initiative to offer Traffic Management Services here in the county, as opposed to contractors having to hire in companies from outside Co. Donegal. A new updated Chapter 8 of the Traffic Signs Manual (2008) was issued on 15 December 2008. This Chapter 8 (2008) document and the accompanying Circular RST 3/2008 constitutes a direction given by Mr. Noel Ahern, T.D. Minister of State at the Department of Transport, to road authorities under section 95(16) of the Road Traffic Act 1961. Details on the publication, application and availability of Chapter 8 (2008) are set out in Circular RST 3/2008 . Click here to find out more….